This post has been viewed 3786 times. Largely overlooked by the Western news media over the past few weeks was an enormously significant story. The government of Iraq is moving forward with plans to protect the archaeological remains of the ancient City of Babylon, in preparation for building a modern city of Babylon. The project, originally started by the late Saddam Hussein, is aimed eventually at attracting scores of "cultural tourists" from all over the world to see the glories of Mesopotamia's most famous city. What's more, the Obama Administration is contributing $700,000 towards "The Future of Babylon Project," through the State Department's budget. 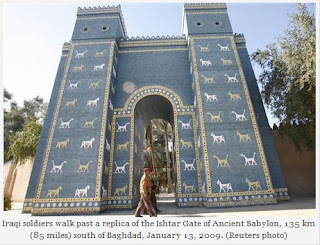 "Officials hope Babylon can be revived and made ready for a rich future of tourism, with help from experts at the World Monuments Fund (WMF) and the U.S. embassy," reports the Reuters news agency. "'The Future of Babylon' project launched last month seeks to 'map the current conditions of Babylon and develop a master plan for its conservation, study and tourism,' the WMF says. 'We don't know how long it will take to reopen to tourists,' said Mariam Omran Musa, head of a government inspection team based at the site. 'It depends on funds. I hope that Babylon can be reborn in a better image.'" "Cultural, religious, archaeological, and biblical tourism is a big opportunity for Iraq. I think rebuilding Babylon is a wonderful idea, as long as it is not done at the expense of the antiquities themselves." For many, I know the rebuilding of Babylon seemed like a far-fetched idea in the Bible. For many more, it seemed like a far-fetched idea in 2006, as well. But skeptics and cynics take note: now that the insurgency is dying down, the Shia-led government of Iraq is actually moving forward with this historic and prophetic project. They say Babylon will be "reborn." And they're right. It will be. Stay tuned.